At the University of the Philippines in Diliman, Quezon City, resilience education is a part of the curriculum. 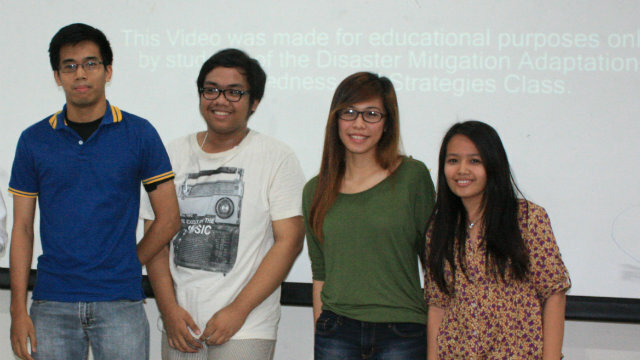 Civil Engineering 10 is a class on disaster mitigation, adaptation, and preparedness strategies for UP students. It was first taught during the 1st semester of school year 2013-2014. The class is managed by a team of 6 teachers from different academic fields. The University of the Philippines-Philippine General Hospital (UP-PGH) will showcase “green” technology using “cool roofs” to mitigate the impact of climate change in the country. Under the leadership of Mayor Alfredo ”JR” Coro II, a UPLB alumnus, Del Carmen’s partnerships with government agencies and NGOs have resulted not only in the conduct of information and education campaigns on climate change, but also workshops, seminars and training on livelihood programs, maternity and child care, education, as well as solid waste management and renewable energy power generation. According to Dr. Merlina N. Andalecio, UP Visayas Associate Professor, the UPV-College of Fisheries and Ocean Sciences is implementing a project that examines the effects of climate on fishing activity/productivity. One of the outputs of the project is a digital library of fishing operations that will be useful for fishery managers and decision-makers. “Climate change will influence the distribution and endemicity of these two diseases,” said De Las Llagas, adding that “these two mosquito-borne diseases (MBD) are directly influenced by climate. Malaria and dengue are seasonal in nature; thus, there are high and low peaks in their transmission," explains UP Manila entomologist and public health professor Dr. Lilian A. De Las Llagas. Prof. Romano Antonio Wamil of the UP-CSWCD credited climate change for triggering an observable change in the production of knowledge within universities, leading to more multi-disciplinal research initiatives.